Mountais across the New East have been transformed into alien landscapes by a freak blanket of orange snow falling across the region. The meteorological phenomenon was triggered by storms in northern Africa, which blew sand from the Sahara across the Mediterranean. 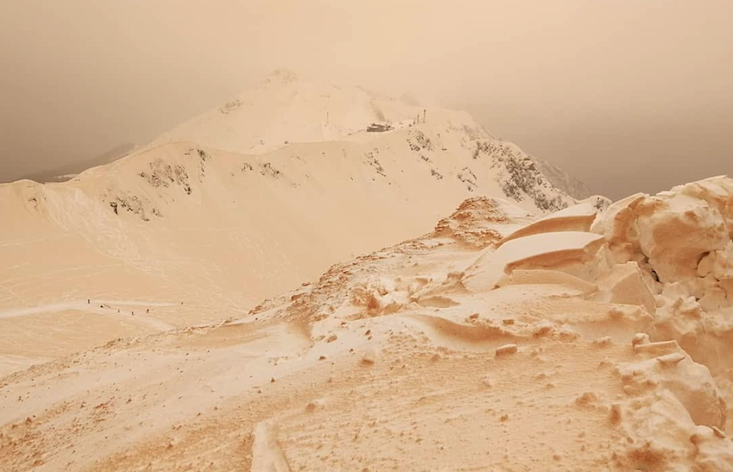 Once in Europe, the sand particles mixed with snow and rain, giving the snow a distinctive orange tint. As the skies darkened over Friday and Saturday, residents in Russia, Romania, Ukraine, Bulgaria and Moldova took to social media to document the brass-tinged snowscapes.